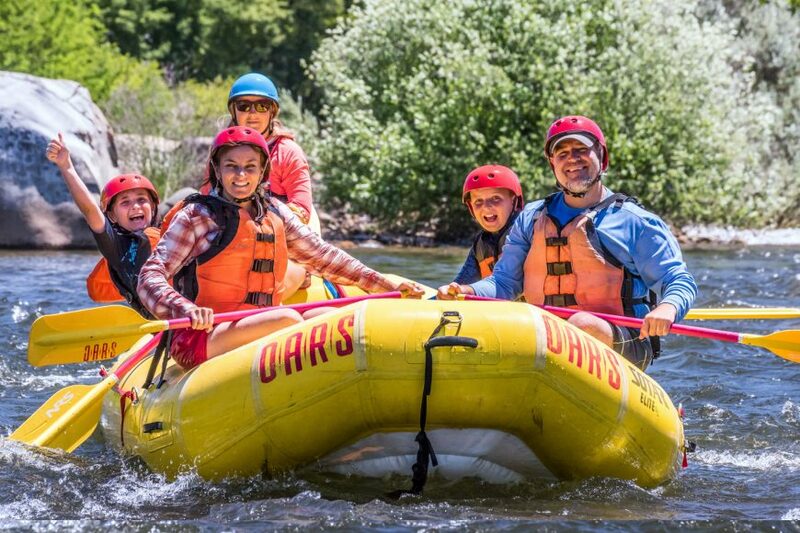 Rafting the South Fork of the American River near Sacramento is the perfect weekend getaway or 2-day add-on to a family vacation in California. 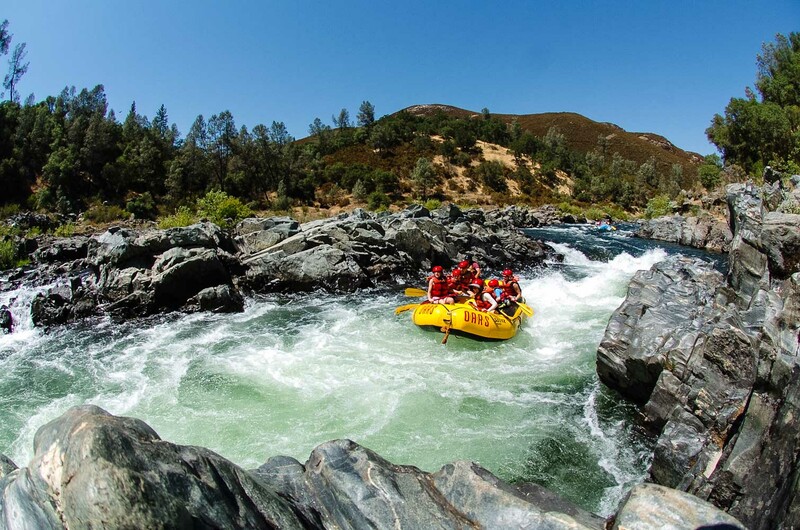 Steeped in Gold Rush history, the American River is lined with oak and pine forests which tumble through the Sierra Nevada foothills, creating rolling valleys and gorges which mirror the flows and rolling rapids of this classic California river. And the best part? 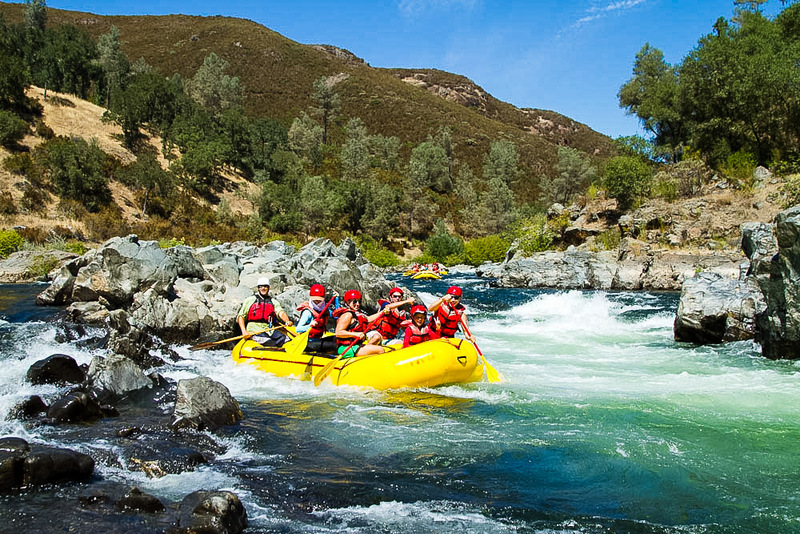 You can find scenic wilderness, gold rush history and wonderful whitewater rafting on the American River just an hour away from Sacramento. 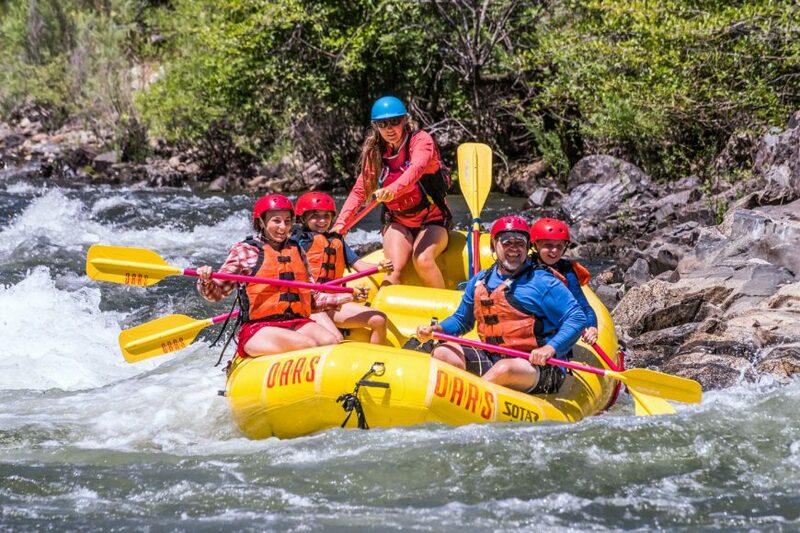 Our South Fork American River Rafting 2-day trip in California is one of our guests’ all time favorite whitewater rafting adventures and offers two fun-packed days of exciting whitewater combined with overnight riverside camping at OARS American River Outpost. 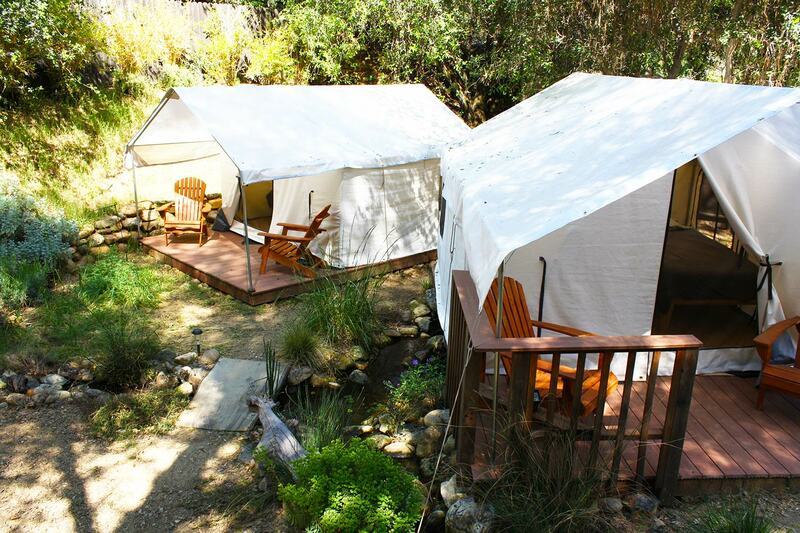 Take a swim or a shower; join a game of volleyball or horseshoes, while dinner is prepared. Information for this Mile by Mile guide was gathered from the books “California Whitewater” and “A Guide to the Best Whitewater in the State of California”, as well as from a variety of sources on the Internet. CHILI BAR HOLE (II). For many years Chili Bar Hole was the site of the Chili Bar Rodeo. On low-water years, the competition moved downstream to First Threat Rapid. Chili Bar was named after the Chilean road builders during the early Gold Rush days. A ‘hole’ is created when the river current drops over a rock or ledge and circulates instead of continuing its downstream flow. MEATGRINDER (III). A long rock garden with big waves and a hidden boulder at the bottom. Meatgrinder is also known as Quarter Mile Rapid because of its length. At high flows, this rapid has some huge waves and holes. RACEHORSE BEND (II+). At Racehorse Bend rapid, the river drops and bends left, pushing current into the right wall. ROCK GARDEN (II). As its name implies, this is a rock garden to be maneuvered through with skill. TRIPLE THREAT (III). Three separate drops, and all three can be run down the middle – with lots of bouncy, splashy fun. First Threat Rapid is a favorite kayak surfing hole and site of the American River Festival Rodeo. The third drop is after a sharp left-hand bend. TROUBLEMAKER (III+). 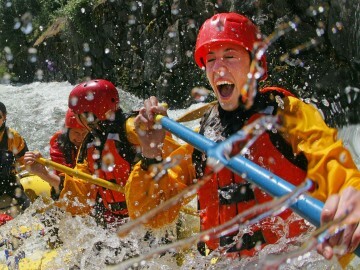 This is the biggest rapid on the upper section of this whitewater rafting trip. The river bends sharply right and then left, passing Gunsight Rock. It’s also sometimes referred to as “S-Turn” rapid. Professional photographers frequently are stationed riverside, as are a host of whitewater enthusiasts who are often cheering and applauding as you pass through the rapid. 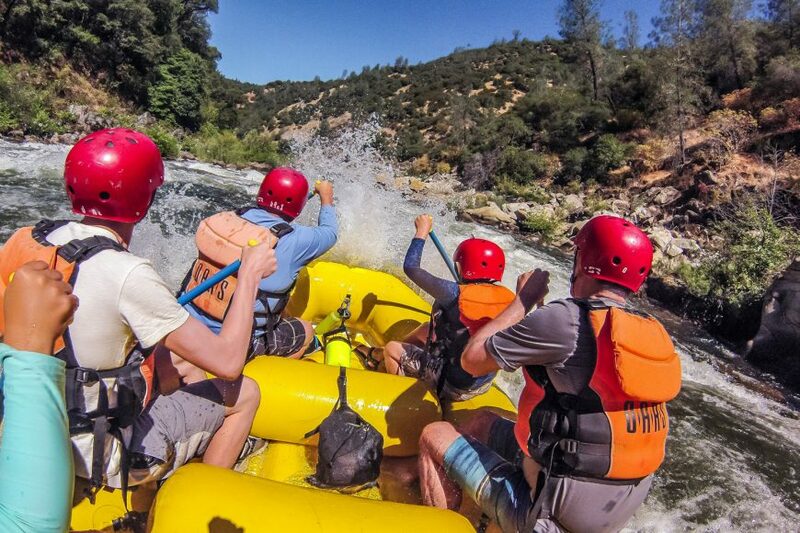 You may review and/or purchase photos after completing your American River rafting experience. American River Resort. 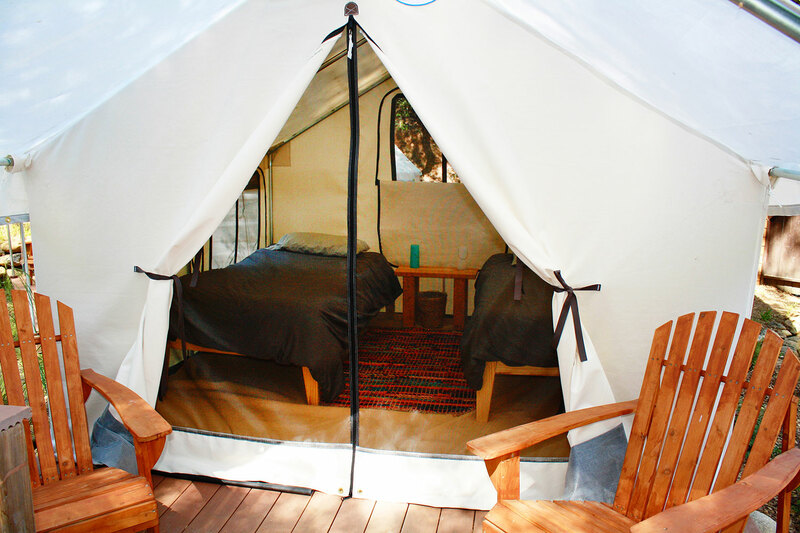 A short drive on Hwy 49 from the James Marshall Gold Discovery State Park, the resort offers riverside lodging, camping and hookup sites. Coloma Bridge. Built in 1917, also known as the “one-way bridge.” There is no parking or river access. BEGINNER’S HOLE RAPID (II) Also known as “Taco Bender” this is a fun play spot for kayakers. OLD SCARY (II). The river bends sharply left, with an island midstream. Old Scary used to be one of the most difficult rapids on the Chili Bar-to-Coloma section of the South Fork until high water in 1982 changed the rapid. LAUGHING EDDY (II). Also known as Blue House Eddy or Whiplash. There is a sharp-edged eddy on river left, at the blue house shortly above the bridge. An eddy is an area of usually calm water behind or downstream of an obstruction in the main current, such as a rock, where water flows counter to that of the main current. TAKE OUT (end) for OARS Chili Bar trips. 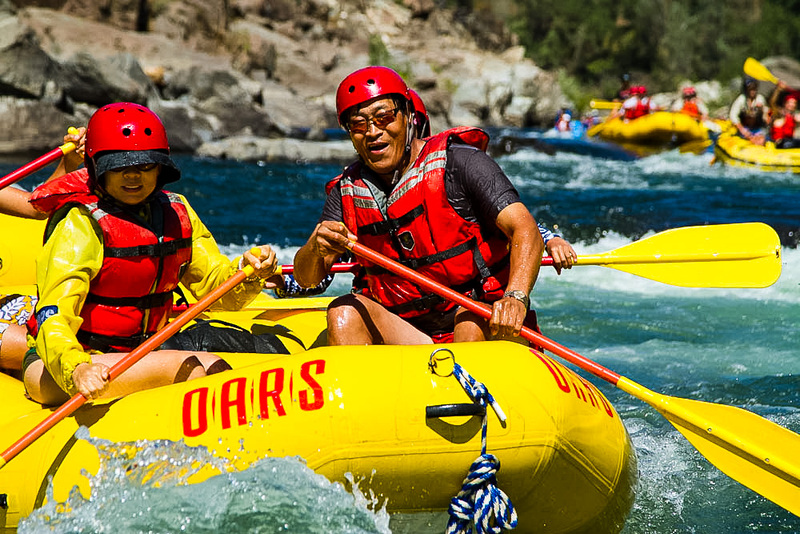 TAKE OUT for the South Fork American River Chili Bar Run is at OARS American River Outpost. The meeting location and put-in (start) of our Lower South Fork American River Gorge Run trip is the private OARS American River Outpost 7330 River Park Drive, Lotus, CA 95651: Located on twelve gorgeous acres, stretching over a third of a mile on the riverfront, offers modern shower and bathroom facilities, a sand volleyball court, horseshoe rings, tons of lawn game sets, and an unequaled list of amenities for your comfort. HIGHWAY RAPID (II+). A long, curving rock garden. SWIMMER’S RAPID. 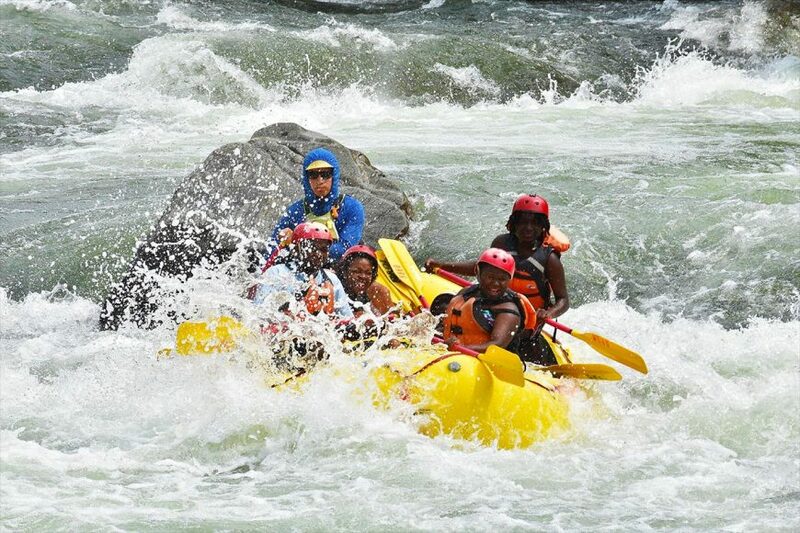 Swimmer’s Rapid is a great spot for rafting passengers to jump in and experience what it feels like to swim a rapid. It is a fun wave train rapid. Public restrooms. 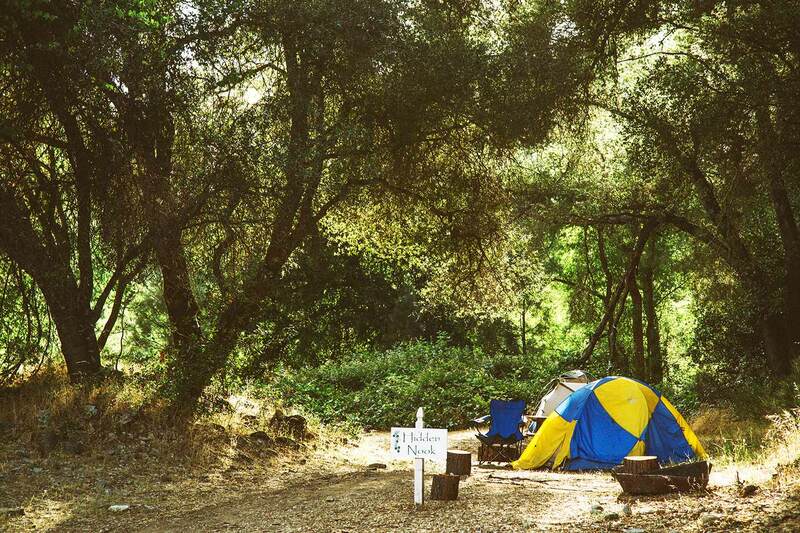 These are the only public facilities on the South Fork American River whitewater rafting trip. Gorilla Rock. This rock, sometimes referred to as Convict Rock, really looks like a gorilla. FOWLER’S ROCK (III) Fowler’s Rock is the first big rapid on the South Fork’s lower section. The river bends left into a short pool then back to the right where a boulder cluster marks the entry to the rapid. SATAN’S CESSPOOL (III+). 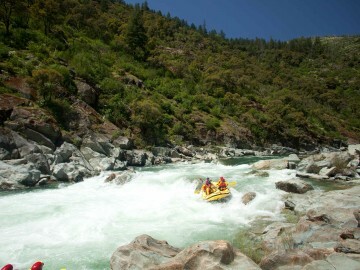 Satan’s is the biggest rapid in the Gorge Run of the South Fork American River. A rock above the final drop provides a good vantage point for photographers and spectators. Professional photographers are frequently stationed here with their cameras. SON OF SATAN’S or DEAD MAN’S DROP (II+). SCISSORS (III). The river turns left down a narrow, rocky chute with big, irregular waves. LOWER HAYSTACK CANYON (II+). A fun, bouncy rapid with big standing waves and short drops in a narrow section. BOUNCING ROCK (II+). This rapid provides a bouncy whitewater ride. HOSPITAL BAR (III). Named for a medical tent set up here during the Gold Rush, this is the last big, splashy rapid on The Gorge Run. The rapid is a rock chute that bends left and then right. It provides surprising whitewater fun. Professional photographers are sometimes stationed here with their cameras. RECOVERY ROOM (II+). Big, fun waves and clean drops. SURPRISE RAPID (II). If the Folsom Reservoir is full, there will be a flat-water paddle or a tow-out, and this rapid will be under water. Class II rapids continue to mile 20 if the reservoir is low. It is a treat to find Surprise Rapid uncovered! TAKE OUT (end) for OARS Gorge Run trips. TAKE OUT for the South Fork American River Gorge Run is at Salmon Falls Bridge at Folsom Reservoir. 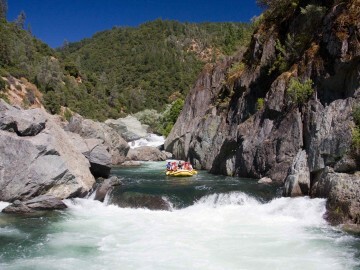 Looking for a 1-day California rafting adventure? 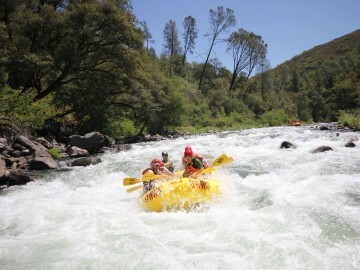 We offer South Fork American River trips 7 days a week, starting at $109!